Meditation is an undeniably beneficial practice that will provide you with endless positive results. This is a time that is completely and wholly yours. No matter your religion or spiritual beliefs or your economic status, meditation can offer excellent results. Meditation crystals (or stones) are powerful tools that can help to deepen meditation and make it more effective if you want to achieve a specific outcome. Any crystal or stone can be used but they are very personal and you need to take time to select what is right for you. Before knowing how to meditate with crystal, it helps to understand a little about chakras. You have seven main chakras (lower three - root, navel, solar plexus. Fourth - Heart. Upper three – throat, brow, and crown). All of them must be aligned, opened and activated for you to be in the best mental, emotional and physical state. When you use crystals to meditate, it alters the energy levels of the chakras, making meditation more effective. Every crystal has different effects on the chakras. If you are meditating for healing of emotional wounds, for instance, a crystal-like rose quartz, associated with the heart chakra, may be chosen. If you are a beginner, quartz is recommended for meditation. Clear quartz acts as an amplifier. Consistent exposure to quartz during meditation can raise your vibrations to a higher frequency and open up other states of consciousness to you. Quartz Crystal is one of the best crystals for meditation because it can be programmed with your meditative intention. Using palm stones is another good way to begin if you are learning how to meditate with stones. The reason stones are called “palm stones” is because they fit perfectly into the palm of the hand. Palm stones are smooth, polshed gemstones. QGEM offers many different types of carved oval stones. Crystals can be held in the hand while meditating or placed on the body touching the skin. If you are holding your crystal, make sure it sits comfortably in your hand. If it has a point, hold in facing inwards to help the energy to flow through you. Relax your mind and think about immersing yourself in the crystal’s energy. Synchronize with its vibrations. Share with the crystal what you want to achieve through your meditation. Setting intentions will help to enhance and magnify your results. As you breathe in and out, release any tension and continue to be aware of and take note of changes in your body. Depending on what you want to achieve, your body may start responding in different ways. If healing is your purpose, see energy flowing to the location of your pain. If you want to open your energy centers, see the energy flowing to the right chakra. If you are seeking understanding, see the energy flowing into your mind. When it’s time to stop, you will know it. Slow down the energy flow and you can eventually set down the crystal. Meditating with chakra stones involves placing the appropriate stone upon each chakra. Lie face up on a bed, floor or any flat surface. Place a red stone just above where your legs are attached to your body. Place an orange stone on your abdomen and a yellow stone about 2 to 3 inches above your belly button. Place a green stone over the heart in the center of your chest and a blue stone in the middle of the throat. Place a purple stone in the center of the forehead, just above the root of the nose. Finally, place the pointed end of a single quartz crystal toward the top of your head. Once you have placed all the crystals, close your eyes and visualize the energy of each crystal flowing into your chakras - from the red stone grounding your experience in reality up through to the purple energy opening your third eye and finally, see the crown of your head opening. Now rest and remain relaxed, ready to receive what comes. When you’re finished, pick up the stones in reverse order and put them in a bowl of warm water with a teaspoon of salt to cleanse them. Pour off the salt water, wash them, dry them and put them back in your pouch. 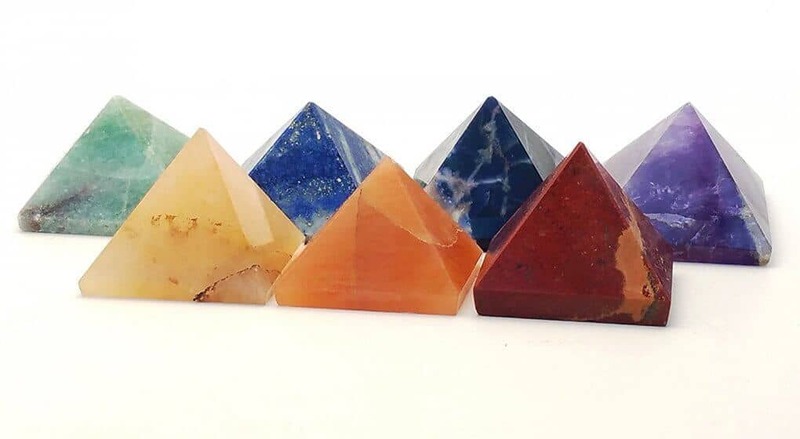 A natural 7 stone set in a pouch by People Crystals includes red jasper, orange aventurine, yellow aventurine, green aventurine, sodalite, lapis, and amethyst. It removes physical, emotional and spiritual blockages and also has the ability to enhance the energy of other stones placed on or near it. It is associated with the crown chakra and helps you to connect with higher powers. It is one of the few minerals that can be used on all chakras to bring about change and transformation. A kit from Dancing Bear includes three selenite sticks, each measuring approximately 6 inches in length and half an inch in width. It also includes a free fluorite crystal and educational cards. When your heart chakra is blocked or closed, it’s hard for you to feel worthy of love or to offer love to someone else in its purest form. Incorporating rose quartz into your daily meditations will help you to heal emotional wounds and traumatic memories so you can grow emotionally. Amlong Crystal balls, made of reconstituted quartz crystal, are a beautiful rose pink color. A ball comes with a stand so can be placed on a meditation table. Amethyst, with its purple color, has been esteemed throughout history for its beauty and power to soothe the mind. Amethyst can help you to attain an elevated state, especially if it is placed between your eyebrows (your third eye). It has a calming effect and works in the spiritual, emotional and physical planes. It brings balance and peace, helping to heal losses and grief, promoting inner strength and emotional stability. It also has the ability to enhance creativity, stimulating the intuition and imagination and refining thought processes. It helps you to assimilate new ideas and turn thoughts into action. Three of the must-have crystals for meditation are quartz, rose quartz and amethyst. A set of these three crystals will provide you with a good start if you are a beginner in meditation. A quartz, rose quartz and amethyst set by Banshren measure approximately 2 inches tall and are flattened on the bottom so they can stand when not in use. Use them individually for specific healing techniques or together if desired. Each stone carries a different meaning and healing properties. There are three main stones that are used to meditate including quartz, selenite and palm stones. Quartz is said to help concentrate and focus your meditation. This stone also increases the power of stones around it. Try using this in conjunction with another stone. Selenite is a used to free your mind. Use this type of crystal after a long day’s work to help you relax. Palm stones are designed to focus your energy while meditating. Hold the stone in the palm of your hand and let your mind focus.